There appears to be a connection between gluten intolerance and autism. Eliana, one of our autistic grandchildren, has Celiac’s disease and cannot tolerate gluten, not even traces of it. 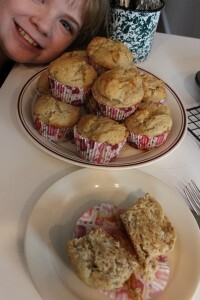 She misses “regular” foods terribly and when she is with me we always try to do a little glutenfree baking. I, too, have a gluten intolerance – get terrific headaches from it – and feel so much better when I eat glutenfree. 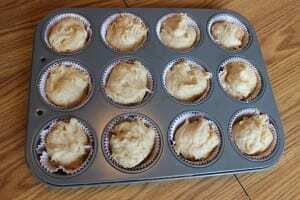 We decided to try a banana bread recipe from Food Network, substituting the regular wheat flower in it with Better Batter’s all purpose baking mix. I have had great success with it as a substitute in other recipes as well. Eliana is extremely bright, so baking with her turns into a scientific experiment. I had just purchased a new set of measuring spoons – each size had two sides – one rounded, one oval. 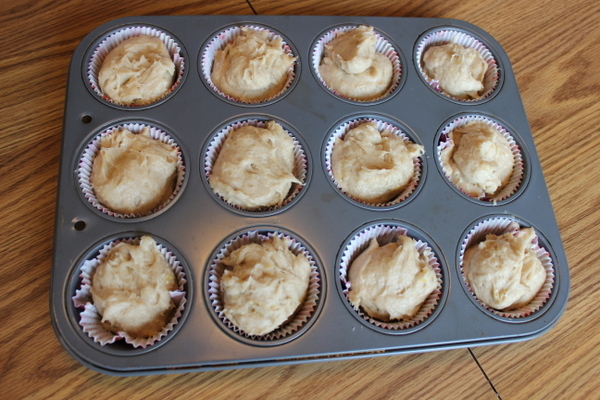 Here are the banana bread muffins – ready to go in the oven. Don’t they look good? Eliana thinks so, too, and she is eyeing the dough with great interest.